← One verse to rule them all? Youth workers have operated for years on the principle that if young people do not come to us, then we go to them – and so we have models of work such as detached youth work and project-based outreach work that complement youth club provision. Yet when it comes to church we still seem to expect them to come to us despite the evidence that the vast majority of teenagers in the UK don’t come to church. So what’s this got to do with school? Quite simply – (almost) all teenagers go to school and so shouldn’t we be going to meet them there? In his book, ‘A Vital Ministry’ John Caperon argues strongly for a recognition of, and investment in, the ministry of school chaplains. He states that chaplains ’embedded’ within the school community can offer key spiritual resources to young people and a significant point of contact between church and young people. Caperon argues that the traditional parish system where the church ministers to the surrounding community is ‘increasingly archaic’ in a culture that experiences community in a variety of networks and gatherings. It makes sense then for chaplaincy to be ‘at the heart of the Church’s mission’. Sadly he records how this ministry has too frequently been overlooked by the Church of England and its significance missed. Yet it seems even more important than ever when recent reports point to the potential demise of collective worship and the Lord’s Prayer is viewed as too offensive for cinema audiences. The school chaplain is uniquely placed to pass on the stories of Jesus and the Bible, to be a representative of the Christian faith and indeed of Christ, – ‘a walking sacrament’ and maybe the only Christian many young people will get to know. 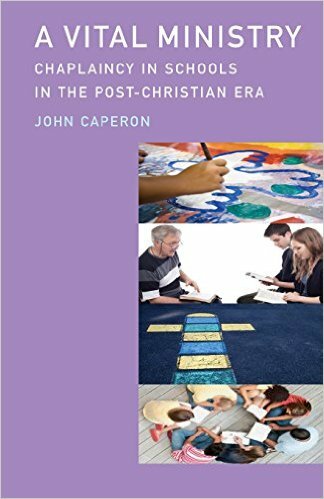 Caperon’s argument is well-made; he outlines the historical, cultural, religious and educational context for the development of chaplaincy before exploring the specific roles that chaplaincy takes in church schools in the UK. His research included listening to the voices of young people with experiences of chaplaincy and this revealed some telling and profound insights – from observations that ‘he’s like a mini-Jesus’ to the recognition of the important role chaplains play in the personal development of students and shaping the ethos of the school, ‘I think it defines the school … it’s actually about building a person’. Based on this evidence, he outlines a four-dimensional professional role for chaplains – spiritual, missional, prophetic and pedagogic and explains how each dimension works in practice before exploring some practical issues for developing school chaplaincy. My only criticism is the lack of discussion over the role of ‘lay’ chaplains. Apart from a brief discussion of the role of ‘para-chaplains’ – schools workers mainly operating from local charities – the assumption is that chaplaincy is an ordained clergy role. Caperon’s recommendations are that school chaplaincy needs to be a valued part of the ‘mixed economy’ of mission and ministry, that we recognise the important ‘ministry of presence’, that chaplains can open up the ‘sacred sphere’ for young people and link them with the ‘chain of memory’ that is the church and so help them discover their identity. This is a unique ministry and for the sake of young people and the church, both now and for the future, it is surely a vital ministry.